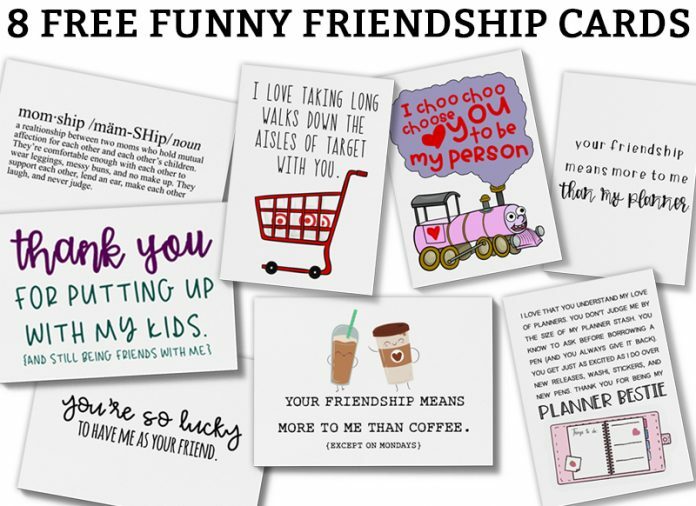 Have you ever gone to the store to find funny cards for friendship? 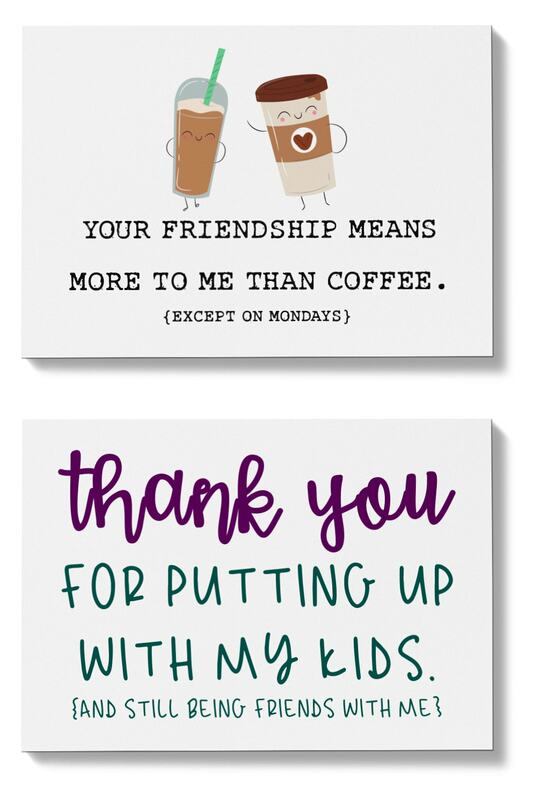 You know, that sarcastic card that totally sums up your friendship with someone? 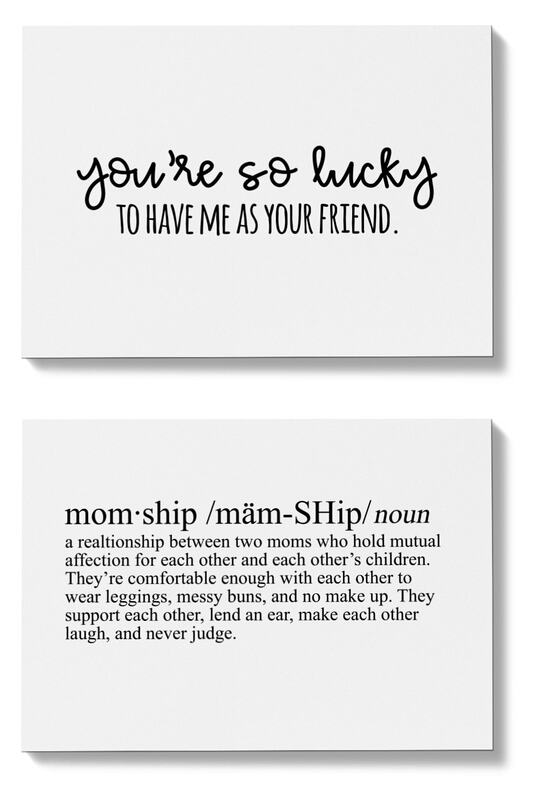 I find that it’s hard to find cards that really get adult friendships and momships (yes, I totally just made up a word. But you know what I mean, your fellow mom friends. And by adult friendships, I don’t mean something dirty). Having a friend you are completely comfortable with is the best. It’s great to have a “real” friend that you can be yourself with. You know, the person whose house you could show up to in leggings, a messy bun, sans makeup, and they wouldn’t judge you one bit. 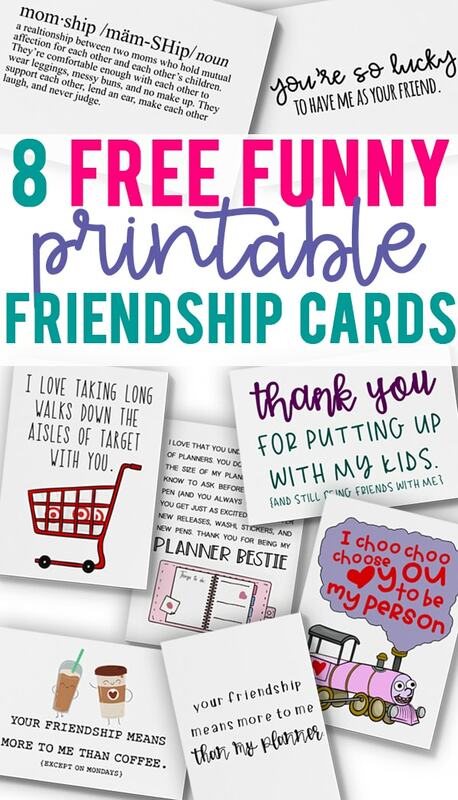 While long sappy cards about friendship may be appreciated by this type of friend sometimes you just want to give them a card that shows you “get” them. One that truly represents the kind of friendship you have. And it seems that traditional greeting card companies just don’t get it. Now, ETSY totally gets you. But sometimes, you don’t have time to wait for a card to come from an amazing ETSY artist. So that’s where I come in. 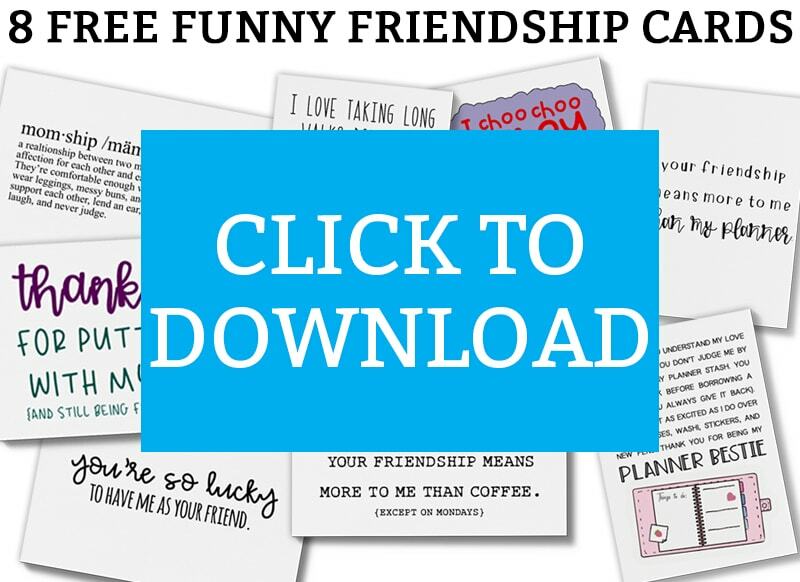 I have a set of funny cards for friendship ready for you to download and give away today. 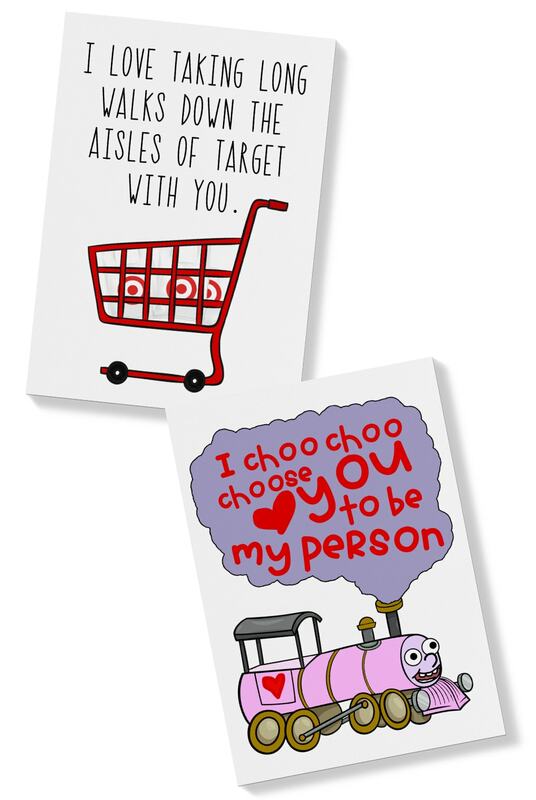 These cards are meant to be used for any occasion. They’re great printable birthday cards for friends, funny Valentine’s day cards that aren’t sappy, and are perfect for some happy mail or just because (who doesn’t love getting real mail for no reason other than to say hi). 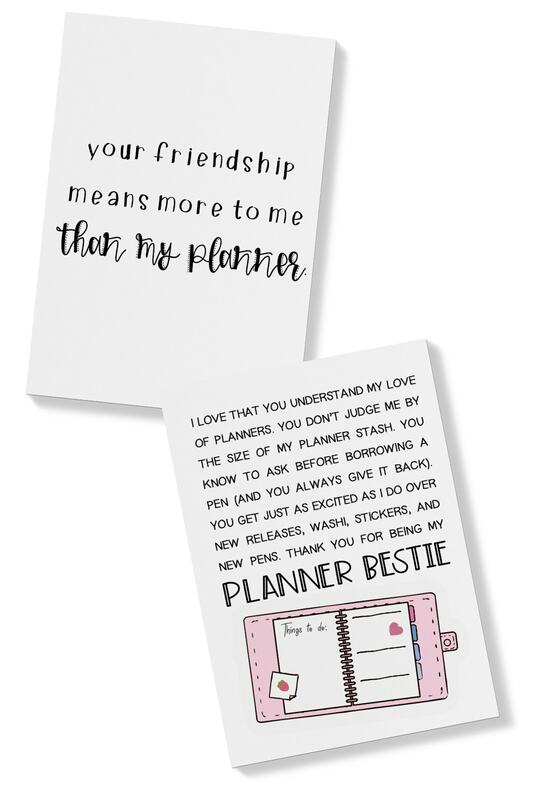 Two of the cards I included in the set are for planner besties. I have a lot of planner lovers on my site and I wanted to do something special just for you. So I am sure you’re wondering what the actual cards look like. In my set of funny cards for friendship, I have included 8 different designs. There are two cards to a page (one card per page would have been just a little too big). You just need to print the page with the card you like and cut the page in half. To download the file, simply click the “Click me to Download” image below to get to the paged where the file is located. You’ll need the members-only password to download the file (subscribe here). The cards are designed two to a page. To print the card you desire, select the page that includes your card. Print and then cut along the black line. Fold the card in half. Unfortunately, you can’t print just a single card (I designed it in a standard size so that the card would not be too large). Need the card smaller? You can print the files at a smaller percentage to make them mini (or you can select to print 2+ pages per page). The files are for personal use only and may not be used commercially in any way. They may not be used for Instagram, Facebook, or other social media outlets as they are in JPEG format but they may be shared on Instagram, Facebook, or other social media outlets as a printed card used within a scene if credit is given. To download, sign up here for the password! HINT: If you’re interested in more printable freebies, make sure to sign up for the “All Things Mom Envy” group. Once you’re signed up, download below using your members-only password.